It looks like a different world to now. People look more nervous in the photographs, like they’re not used to being in them. And though there is colour in some of the photographs, it’s often tinted in. This is a world that was lived mostly in black and white. On the relatively few televisions. In all the newspapers. 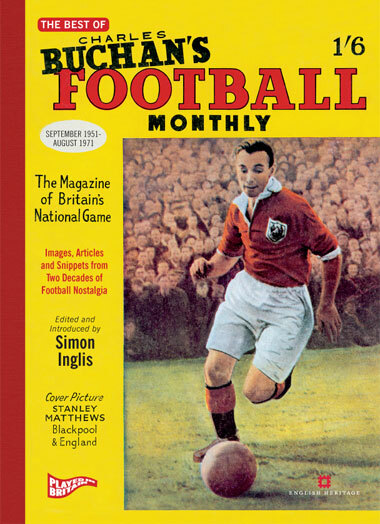 And in the monthly magazine I treasured in the early to mid 1960s, ‘Charles Buchan’s Football Monthly.’ Which I’ve been remembering this week because I borrowed a book of the ‘best of’ it from Allerton Library. And what a treasure it is. Depicting a world where the beginning of success for any young footballer appears to be signified by being asked to sign their autograph. A world where all goalkepers are ‘doughty custodians.’ Where brilliant young Pele of Brazil outrageously appears to be presented as the only black person on earth. But also a world where footballers clearly live amongst the communities that support them. Which takes me, of course back to the north of Liverpool where I grew up. After being born in Walton and spending my very early years in Diana Street, just by Everton’s ground – where every other Saturday I’d stand in the window watching the thousands of people who’d stream past to the turnstiles, fifty yards from where we lived – we moved out to the suburbs where, I was to find, most of the Everton and Liverpool players lived too. 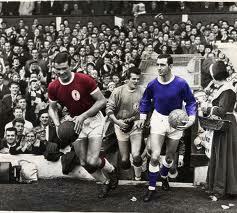 Ron Yeats and Roy Vernon. Not that there was some kind of celebrity guide to the homes of the rich and famous published. For a start they weren’t very rich. The houses they lived in were ‘club houses’ not theirs for the most part. And compared to footballers now, they weren’t all that famous. But to us they were gods and only The Beatles breathed the same air. But we knew where they lived because of the boy grapevine. Someone would be spotted, washing his car or taking in the shopping ‘for’ his beehived wife. And word would go round. 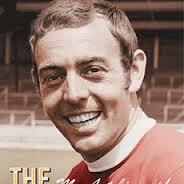 ‘The Saint’ Ian St John. And we would go and get their autographs. In special little autograph books. We’d always go in twos. I’ve no idea how this method was arrived at. We must have realised instinctively that going mob-handed would have resulted in us being seen off. Whereas going on your own, even though none of us knew the actual word then, was a bit like stalking them. So we’d go in twos and give each other courage. Who was going to knock? Who’d speak first? Most of my hunting was done with my main friends Barry Ward or Paul Du Noyer. But never with both at the same time. And each of them was free to hunt with others, particularly where a player lived in a particular other boy’s neighbourhood. This practice led Paul and another boy into their most terrifying autographic incident. When they woke feared Liverpool hard-man Tommy Smith from his afternoon nap! 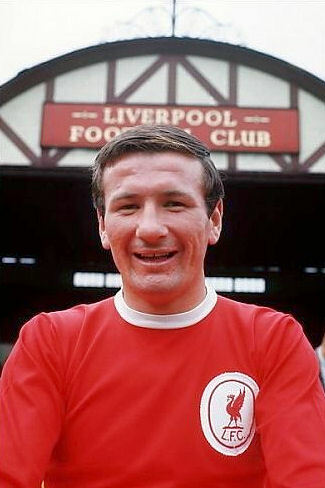 Liverpool hard man, Tommy Smith. Tommy’s wife was just explaining to them that Tommy was asleep when the bleary-eyed tackler appeared in the hall asking what was going on? Paul can still now describe eloquently the blind panic they both went through in that moment. Running was obviously out of the question as even a half asleep Tommy Smith could have easily caught them and brought them both down. So they froze to the spot. Ready to take their punishment. And Tommy of course was sweetness and light. Delighted and even flattered still, that early in his career, to be looked up to by the youth of Liverpool. In fact I can’t recall anyone ever being even mildly rude to us. Gordon West, Ian Callaghan, Ron Yeats, Alex Young, Jimmy Gabriel, Peter Thompson, Brian Labone, Tony Kaye, Brian Harris. All genial and gentle. I had my own ‘waking up’ incident with Everton captain Roy Vernon, and again escaped not only with my life but also with kindly words. Ian St John was my particular favourite. He lived close to me in a little road called Hillcrest, autograph paradise as Alex Parker of Everton lived in the road as well. And Ian never minded my repeated intrusions on his privacy as I would bring yet another keen autograph hunter round to meet him. The pinnacle of my autograph hunting career, though, was Gerry Byrne. 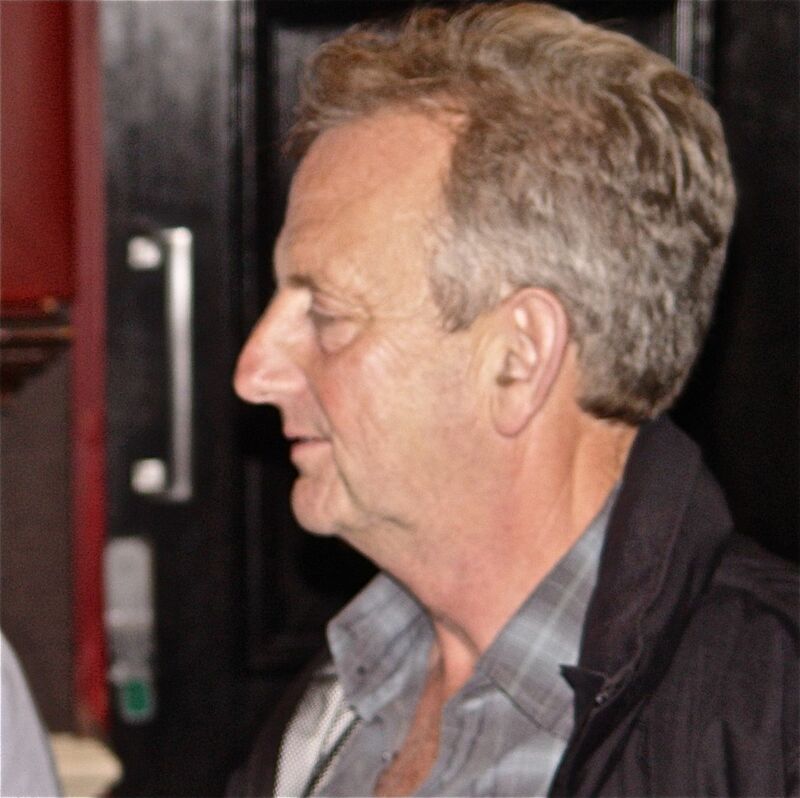 If you’d had to back anyone in a fight with Tommy Smith it would have been Gerry Byrne. Famously Gerry broke his collar bone in the third minute of the 1965 F.A.Cup Final against Leeds United. And because no substitutes were allowed in those days, he played on in excruciating pain through the rest of the match, including extra time. 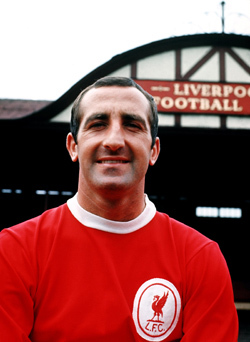 He made the cross for Roger Hunt to score the first of our goals. And the Leeds players never knew he was so badly injured as we went on to win the Cup. A very tough man indeed. So a while later me and Michael Atherton approached his door, just off Sefton Drive, not with fear but certainly with deep respect. And Gerry said ‘Of course you can have my autograph lads. In fact, do you fancy a kick around?’ So off we trooped to a nearby field for a kick around, with Gerry Byrne, of Liverpool FC, who would be in the World Cup winning squad the following year. I didn’t think life could get any better. Soon secondary school happened though. And the boy grapevine died off, as we were sent to separate schools depending on how we did in our ’11-plus’ exams. A cruel separation. Previous good mates like David Wilson, Tony Temple, David Kubiskie and Tommy Coulton sent off in one direction, while me and Barry and Paul were sent the other way. Autographs were over. And life happened. Then, in the summer of 2011, after forty six years apart, Barry and Tommy brought the autograph hunters back together again. Not everyone could make it, including Paul. But it was lovely to see them. The class of ’65. The class of ’65: Barry Ward, Tommy Coulton, Steve Smith, Mike Moran, Peter Clarke, Ronnie Hughes, John Abraham and Tony Temple. And David Wilson turned up later. Still loves The Hollies. Best of Charles Buchan’s Football Monthly available here for £10. Go on. You know you want it. This piece made me feel very nostalgic especially listening to When we were boys. Thank you Mandy, glad you like the song. And glad about the nostalgia. In fact the piece has also been picked up and published by another blog. This helps people with depression or dementia by reminding them of interesting memories to ‘improve their well-being through conversation and reminiscence.’ So I’m really happy about that. Well this piece certainly made me feel nostalgic as well, and your recall of our autograph hunting sessions in the early to mid sixties is very accurate indeed. I seem to recall that occasionally three or even four of us would venture forth, but as you say it tended to work better in twos. Can you imagine 10 or 11 year old boys these days wandering round for hours, unsupervised, and calling at the doors of the likes of Rooney, Gerrard or Suarez to get their autographs ! You forget to mention Alex ‘Chico’ Scott who lived a few doors away from the ill-fated Tony Kay opposite The Everest. My memory of Roy Vernon is somewhat different to yours and Paul’s. I guess I must have been with Tony Temple on this particular Sunday afternoon, as we bravely knocked on his door. No answer. We knocked again, louder, there was definitely someone in, the lights were on. Still no answer. Bang, bang, knock, knock, ring ring…we persisted. Suddenly the door flew open, and there he was….Roy Vernon, a hero, captain of the almighty Blues. But on that day he was angry and chased us down the path, shouting and swearing at us. (Looking back to be fair to him, he might have been having a sleep, or in the middle of his Sunday lunch or even enjoying a spot of afternoon delight with Mrs Vernon. Or we might have been the last of a long line of autograph hunters that afternoon). When I got home my dad asked how we’d got on that day. ‘Great. Look here in my book dad, I got Brian Harris, Brian Labone and Ron Yeats today….but Roy Vernon was horrible’ I recounted my tale while my dad listened. Finally, he nodded wisely, and gave me the benefit of his understanding of the situation. “He’s Welsh, son. They’re not very nice people” ! A couple of years ago I encountered a 60-odd year old, overwight, and clearly unwell Gordon West, and got into conversation with the great man. He was signing autographs as part of a ‘meet & greet’ session before an Everton match, and asked me after a few moments chat if I wanted his autograph. ‘I’ve already got it thanks Gordon’ I replied. ‘I used to come round to your house in Claremont Avenue in Maghull when you lived next door to my Auntie Mary.’ He remembered my auntie and uncle and we chatted for a while about Maghull and his time with Everton in the sixties. A lovely guy, now sadly deceased. 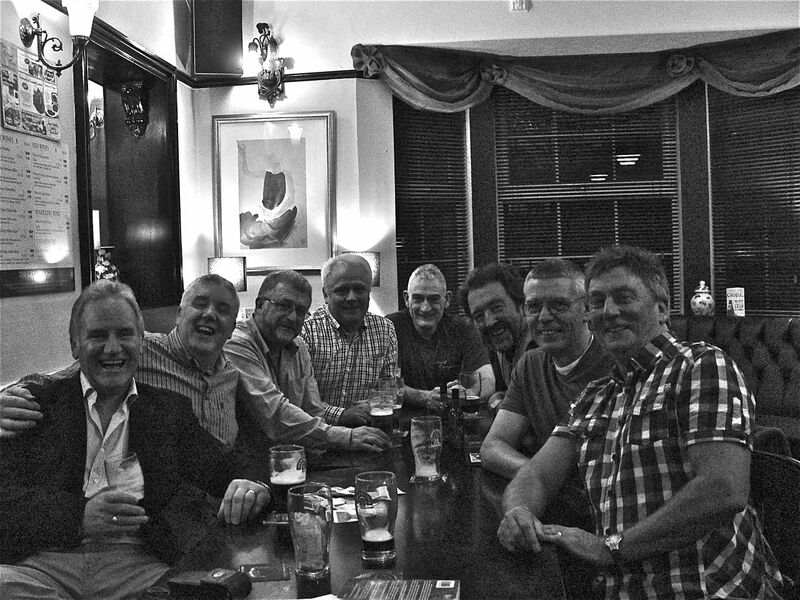 Thanks for putting the photo of our Primary School reunion on to this blog. It was a very enjoyable evening. Unfortunately I mislaid my autograph book many years ago. Have you still got yours ? Hi Barry, Yes I was thinking a bit more after I wrote this about how young we were. And obviously we never thought of ourselves as charming, but I suppose we actually were. Polite and earnest little boys turning up at footballer’s doors and gazing up at them like they were our heroes. Which they were. Even the ones who payed for Everton! Sorry to hear about your Roy Vernon experience again. I remember that from the time now and us all speculating – since everyone else was always so nice – that maybe he had been ‘on drugs.’ Though we really had no idea what that might actually be like! And your Dad, so easily able to dismiss an entire nation – 30 miles away from us. Priceless. And no, I haven’t got my autograph book. Nor can I remember when it left my life. If I’d had it, I wouldn’t of course have made the Alex Scott omission. I had to laugh at the tales of your autograph hunting days. I must admit I was never one for autographs but I do recall seeing Alex Young walking past Woolies on Aughton St in Ormskirk in the late 60’s I was so in awe that the Golden Vision walked along the same street as me I couldn’t speak and the chance was gone. I still have his autobiography Goals at Goodison in possession (not signed unfortunately) and is still something I treasure. Back in the day when footballers were part of the same communities as us. Not locked away in some gated mansion.